Road 281 is our new favorite drive. It runs parallel to the Mexican border and it is a very peaceful drive with lots of tropical lush farm fields and swaying palm trees that line the way. The Santa Ana Wild Animal Refuge is also on this road going south towards Brownsville. If you are a butterfly or bird watcher this area is just the place for you because it is the home to "The Great Texas Coastal Birding Trail for the Lower Texas Coast." We definitely want to take advantage of exploring all these trails and parks but on this day, we just had a nice drive. Mike's Fruit Stand is located a little bit before the Mexican border. We picked up some Sandia = Watermelon and a box of mangos which were so delicious. I spotted these green fruits you see on the lower right hand side, not sure what they are but they looked pretty. Do you know? 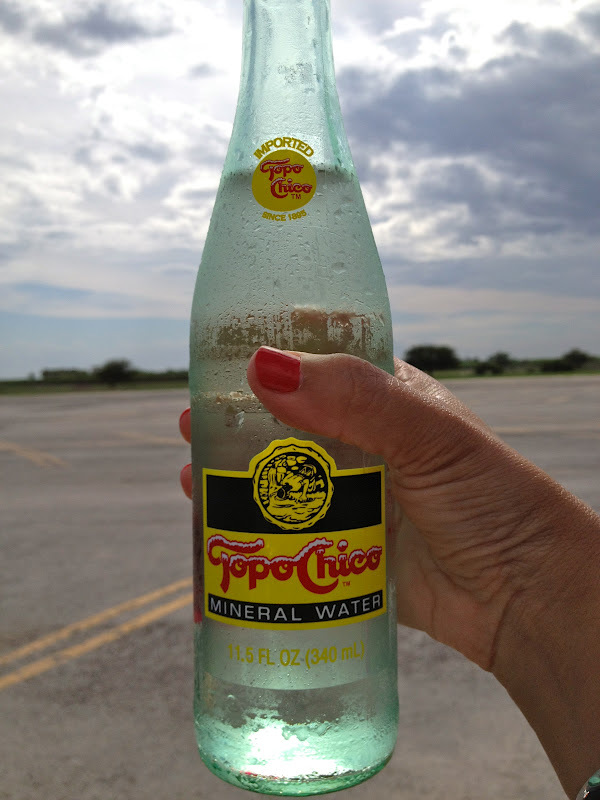 Thanks to Stephanie from Odyssey for suggesting Topo Chico. I love mineral water and picked up a whole case this weekend for about 6 bucks, way cheaper than Perrier but just as refreshing if not more. Living close to the border is a unique experience. The only other border I have visited is back in San Diego, CA and this is nothing like it. Although we are still in the USA, for some reason this area feels like it's own country. As I mentioned in this post, there is a lot of dangerous activity just a few feet away from where I stood taking this Topo Chico picture and it is a real shame because Southern Texas/Northern Mexico is truly beautiful. Just six months ago I was celebrating Christmas by Big Sur, one of the most beautiful places in the world and now I have found another. There are no scenic cliffs, or turquoise waters here, but this part of South Texas has its own kind of raw beauty and character. It sounds a great little road trip! How cool is that water bottle too. I am in love with your pictures here. I think they are fabulous! It is so sad how much scary stuff is going on right over the border, and in that area. You are right though, it's so pretty there, and it's like you are in another country. I love the character of South Texas. I'm glad you are exploring. I can't wait to see more and more pictures from you. The fruit look like green papaya to me. Love them when they're ripe.They are used green in Asian cooking as a salad ingredient. It's papaya. :) They grow wild up in the hills of Tortola (always slightly out of reach, unfortunately) but I've yet to see them in my part of south Texas. How neat that they grow around here, though! Speaking of which, one of our plantain trees is actually producing. I hope they'll ripen. I so miss plantains. Thank you for another nice mention! Topo Chico is my new addiction. I always buy a case of the stuff. South Texas (Texas in general) does have its own raw beauty that isn't of the obvious kind. One has to dig a bit, as you have found. J and I love birds and would like to see Santa Ana Wild Animal Refuge, maybe in cooler weather. Aransas Nat'l Wildlife Refuge is another good one to see, and very close to Corpus; it's where the whooping cranes spend winter. My family and I would about once a year cross over to Progreso and shop. We no longer cross over due to the danger and I have to say that I really miss it. The people were so friendly and we would always get the best made from scratch margarita for $1.50. Yummo! This is a fun post-brought back happy memories!